HTML5 has been adopted among many of the top sites around the web and it's time for the rest of the web to switch over to the smarter and more mobile friendly standard. HTML5 is a standard for displaying multimedia content on the web, and web companies are increasingly adopting it. Last month, YouTube opted for HTML5 as the default video format instead of Flash. According to an infographic from Template.net, HTML5 has many benefits for social and mobile sites. HTML5 has already gained a lot of popularity among the top sites on the web. More than 300,000 of the top 1 million sites use the standard, 30,000 of the top 100,000 sites use it, and half of the top 10,000 sites use it. In a richer multimedia environment, like on top social sites, HTML5 makes a lot sense. There are many benefits to using HTML5 for social and mobile applications. Mobile support is built in to HTML5, so it makes websites accessible across all platforms, and in all browsers including mobile browsers. HTML5 also fully supports audio and video, and treats them like image tags, which reduces the burden on coders trying to insert multimedia. Location support is also built in, which allows your service to make use of geolocation data. 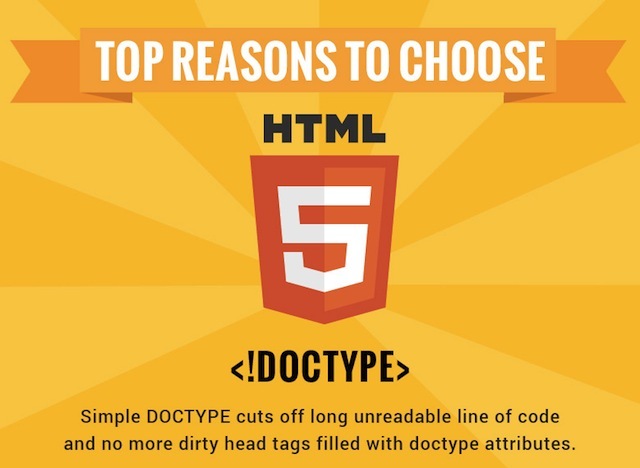 To see the additional benefits of using HTML5 for coders and game developers, view the infographic below.